One word can describe the 14 month old baby development: active. And since they are busy bundling joy, parents are also expected to be busy and should keep with them. If your toddler is at this age, expect a lot of playing and entertainment to satisfy your beloved child. However, keep in mind that toddlers may not be in for happy games or plays all the time due to their ego-centric personalities at this age. How Is Your 14 Month Old Baby Developing? 14 month old baby development can covers several aspects, the following are some of the essential ones. Babies’ physical growth varies, but still there's a normal standard or average growth measurement for your 14 month old baby. The average weight and length are as follows: average height for boys is 78 cm, and for girls is 76.4 cm; average weight for boys is 10.1 kg, and for girls is 9.4 kg. According to the Penn State Cooperative Extension System, your 14 month old baby is able to walk well in general and even do other motions without problems like climbing a step or stand on his own. Grip strength has also improved that allows him to hold a spoon and use it for feeding, stacking several blocks, and rolling a ball without your assistance. Other motions like moving to music, flipping a cloth or book page, and waving should be noticeable at this age. Improved interaction with other children is also observed among 14 month old baby development. They are excited upon seeing other toddler of his age. Being drawn to his peers is noticeable, which is a sign of social development. However, your toddler will not immediately play with the new child present around him. This will happen later on his age. What’s happening is the presence of another child stirs his curiosity. Understand the choices and also consider this as a phase that prepares the toddler to monitor behavior by himself. 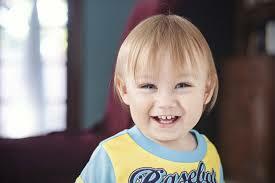 Your toddler will present improvement in emotional development by showing more emotional depth. Cognitive skills also show significant improvement at this age. At this point, the toddler can mimic his parent’s language as well as behavior. You will feel as if someone is observing your movements because your toddler will give you his full attention. Exploration is also common, which drive mothers to search for their toddlers around the house. You need to use your sensory abilities to understand what your toddler wants because communicating with him is limited to several words and phrases that can be clear or unclear at times. Communication also develops at this point. In fact, he will show you what he wants using gestures and some words. Several tools can also be used for communication. A common example is your child bringing you a jacket. This can be an indication that he wants to go or play outside. Bringing you a CD or DVD means he wants to listen to music. Aside from tools, your child may also use several words that may not really make sense. Estimate what he means with these words could help you understand what he meant. This age is also the time of parroting, which means your child will mimic the words he hears. You should be mindful of the words you say at home like avoiding swear words as he will pick those up for sure. A 14 month old baby has his own specific needs, so taking care for your toddler includes the following procedures. Introducing new foods is important at this point. Even if your toddler does not like the new food, try giving it again the next time. Some toddlers take some time before liking the new food. Make this as an opportunity in broadening his food choices and palate. Another tip is to eat the food you want him to try. Toddlers imitate their parents and they tend to try the food upon seeing you eat it as well. Cut food into smaller pieces and introduce whole grains for better nutrition. Children have different sleeping patterns according to age. Your toddler’s total sleeping time is around 13 to 14 hours. Night time sleeping is around 11 to 12 hours with two to three hours nap, which is equivalent to one to two nap times. Nevertheless, these are average sleeping hours as some kids may need more sleeping. Some sleep tips will help your toddler maximize his sleeping time. If your kid is active, your goal is to help him relax at night since this is going to be his challenge. Calm him down during evening by giving him warm baths or reading him stories. Toddlers tend to be picky on their food, but they will gladly do anything for their enjoyment. They are continuously exploring different parts of the house, but it is not advisable to keep him too sheltered. If you have a maintained garden at home, keep in mind that chemicals like fertilizers can put your child’s health at risk. Having pets can be entertaining for your child, but it does not mean that you can leave them with animals even if they are domesticated. As a kid, he does not know how to deal with animals and they can be unpredictable. Colds usually occur at this age and it can be troublesome. However, treatment for colds is mere cuddling and some symptomatic solutions. In case your child has no appetite, shows lessen instances of urination, or worsened cough, bring him immediately to his pediatrician for check-up. This age is a good opportunity to introduce reading to your child. Read together and let him see you read as well. Usually, parents choose their books, but it is also best to bring your toddler to the bookstore and search for books together. Cheaper books are sold at second hand bookstores and other sellers. Promote reading to your home to help your child’s knowledge in language to develop his communication skills. They say that playing is a portal to learning. It is best to promote learning while playing. Good and fun games for your 14-month old toddler include blocks, paper and crayons, toy vehicles, and many more. Keep in mind, however, that development varies across children and some kids at this age might not be ready for such activities. If so, wait and try again next time. Tooth brushing should be done at least twice a day. Use a small and soft-bristled toothbrush designed for kids and plain water for brushing. Naps in the afternoon may lessen to just one nap time, which can affect their nighttime sleeping pattern. Plan his sleep time as you go through your day. Clothes changes can occur several times a day due to his love for activities. Prepare several play clothes that will last for a long time despite how rough they play. Sun protection is crucial at this point since your child will play outdoors regularly. Keep him from playing outdoors around 10 A.M. to 3 P.M. since sunlight is brighter during these hours. Be sure to share responsibilities with your partner. Do not take all the responsibilities. Give your partner some responsibilities as well to help him know his child as well. Although your child is probably taller now, do not place him immediately on a bed. Cots are more beneficial at this point because it will keep an active child in place.